The berserker warriors (Old Norse: ber-serkir, meaning “bear-shirt”) were said to be Odin’s special warriors and an important part of Viking kings’ and chieftains’ elite forces during battles. In the Old Norse literature they are described to have fought in a nearly uncontrollable, trance-like fury, hence the English word “berserk” and expression “going berserk”, still used today. Most historians believe that these warriors worked themselves into a rage before battles, while others believe they might have consumed some sort of drugged foods. In earlier studies, the element ber- was often misinterpreted as berr-, meaning “bare”, understood as indicating that the berserkers fought naked. This interpretation has since been abandoned. Berserkers appear in sagas and poems, many describing them as ravenous men who plundered and killed indiscriminately. There are also descriptions of Viking berserker warriors wearing wolf skins. The earliest surviving reference to the term “berserker” is in Haraldskvæði, a skaldic poem composed by Thórbiörn Hornklofi in the late 9th century in honor of King Harald Fairhair, as ulfheðnar (“men clad in wolf skins”). The fury the berserkers experienced was referred to as berserkergang (“going berserk”). This condition is said to have begun with shivering, chattering of the teeth, and chill in the body, and then the face swelled and changed its color. With this was connected a great hot-headedness, which at last gave over into a great rage, under which they howled as wild animals, bit the edge of their shields, and cut down everything they met without discriminating between friend or foe. Theories about what caused berserker behavior include ingestion of materials with psychoactive properties, psychological processes, and medical conditions. Today, some researchers still believe certain examples of berserker rage to have been induced voluntarily by the consumption of drugs such as the hallucinogenic mushroom Amanita muscaria, commonly known as the fly agaric, or massive amounts of alcohol. While such practices would fit in with ritual usages, however, it would be a drawback during battles when you had to stay sharp and focused. Other explanations for the berserker’s madness have also been put forward, including self-induced hysteria, epilepsy, mental illness or genetics. Or, were these men simply superior Norse warriors, and all the theories put forward are just…theories? ‎’Theories about what caused berserker behavior include ingestion of materials with psychoactive properties, psychological processes, and medical conditions. There is not a single reference in the Norse sagas that clearly states that the Berserkers took drugs before combats to enter what is referred to as a ‘berserker’ state of mind, nor is it supported in archaeological finds. Over and over, many of these ‘scholars’ misses out on the main issue here; that the berserkers were extremely skilled and experienced warriors who were able to suppress their fears and able to stay fit and focused throughout a long and exhausting fight. Drugs and booze were probably out of the question to do this as it only would blur you mind. It is more relevant to compare a berserkers preparation for battle with how professional soldiers or top athletes like downhill skiers, boxers, mma fighers and base jumpers do to perform at their best. The berserkers were superior fighters, and may have been concidered a special warrior class among the Vikings rather than a bunch of crazy maniacs. Thank you for a very insightful comment, Jørn Olav! And you are probably right… Pure logic! 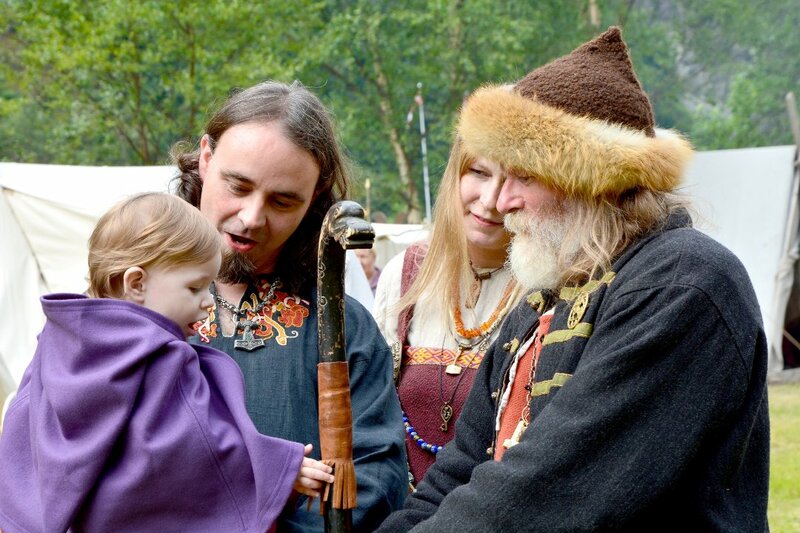 Keep posted – we will write more about the Viking Age! Whatever they did-I highly think that doing it naked was probably not the best way to fight- even they might be just a little vulnerable naked- shield, hammer, ax, sword or otherwise.